Big man Mick Pennisi decided to finally call it quits after 17 seasons of playing and will relocate in Thailand to mind his poultry business. 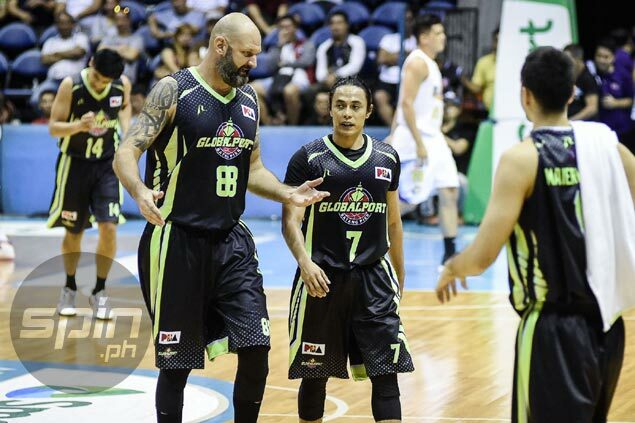 Both Globalport alternate governor Eric Arejola and team manager Bonnie Tan confirmed to SPIN.ph about Pennisi’s decision to bid the team goodbye Friday night during the Batang Pier’s 119-112 win over TnT Katropa in the Governors Cup at the Ynares Center in Antipolo. “Yes, he already told us about his plan. Matagal na raw kasing naka-set yun,” said Arejola. Tan added management was actually trying to stall the retirement of the 42-year-old Fil-Australian since he’s just a few points away from achieving a career milestone. “He’s just 33 points away from becoming a member of the PBA’s 5,000-point club,” said Tan. “Kaya nga sabi naming tapusin niya na itong season bago siya umalis. As the 6-foot-11 Pennisi walks away, only Asi Taulava, JayJay Helterbrand, and Dondon Hontiveros are the remaining active players who are in their 40s and above. But Pennisi leaves the league having achieved a lot of things. As one of the six players elevated by Red Bull when it took its act from the amateur to the pro ranks, Pennisi was a major part of then coach Yeng Guiao’s rotation and helped the franchise win three championships from 2000 to 2006. He also had stints with San Miguel where he also won two titles in 2009 and 2011. Barako Bull, Star, Phoenix, and finally Globalport were the other ballclubs where Pennisi played. A product of Eastern Michigan, the lefty big man hit his 700th career three-point field goal in 2012 while with Barako Bull, becoming only the eighth player to achieve the feat in an elite list that included such great shooters like Allan Caidic and Ronnie Magsanoc. Incidentally, on that same day, Pennisi became viral on social media after reacting late in a flop when San Miguel import Will McDonald threw the ball on him and hit him in the head. Pennisi also suited up for the Philippine team, including the ill-fated 2002 national squad in the Busan Asian Games. He retires with averages of 7.6 points, 5.3 rebounds, and 1.2 assists including a 35 percent shooting from the three-point line.